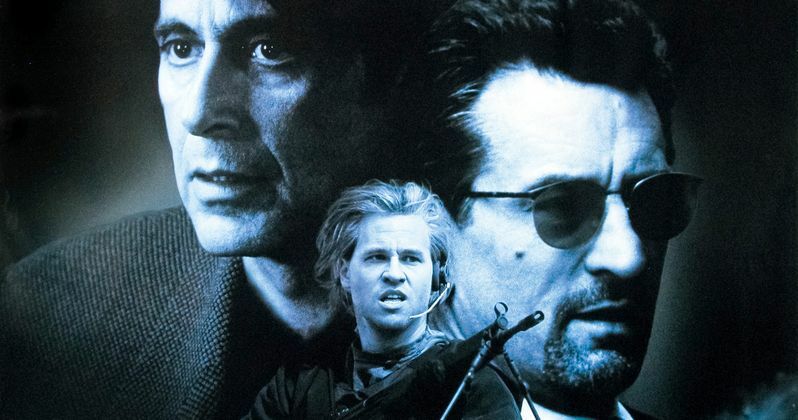 It's been over two decades since director Michael Mann unleashed his action-packed classic Heat onto the world, which still has legions of devoted fans to this day. While there have never been any official plans for a sequel, the director will now revisit this iconic crime saga in a prequel novel he is writing with celebrated crime author Reed Farrel Coleman. The novel is expected to be published next year under the filmmaker's Michael Mann Books imprint at William Morrow/HarperCollins. Deadline reports that this book, which doesn't have a title at this time, will provide an origin story for all of the L.A.-based criminals and law enforcement officers that are featured in the 1995 movie. This book will delve into how Neil McCauley (Robert De Niro) met Chris Shiherlis (Val Kilmer), Michael Cherrito (Tom Sizemore) and Trejo (Danny Trejo) in Folsom Prison, and formed his crew. This story will also feature McCauley's mentor, who taught him not to get attached to anything he couldn't leave in 15 seconds if he spotted the "heat" coming around the corner. On the other side of the law, the book will also delve into some early cases by Vincent Hanna (Al Pacino), including a scene teased in the movie by Nate (Jon Voight), who told McCauley about the time Hanna tracked Frankie Yonder in Chicago before he built his own crew. Neil McCauley, Vincent Hanna and many other characters, including the wheelchair-bound Kelso (Tom Noonan) who provided McCauley's crew with the bank schematics, are all based on real cops and criminals from Chicago. Michael Mann's longtime friend Charlie Adamson served as the basis for the real Hanna, and he chased down the real McCauley and actually met with the criminal for coffee in real life, much like the iconic scene in the movie. This report reveals that Reed Farrel Coleman will start combing through the writer-director's research files. The author will becomes Michael Mann's second major publishing partner through his Michael Mann Books imprint, following his team-up with The Cartel author Don Winslow. They will be working on a novel based on the true life exploits of mafia boss Tony Accardo and his protege Sam Giancana. Reed Farrel Coleman is best known for his popular Gus Murphy novels, and he has also become a three-time New York Times best selling author after taking over the Jesse Stone novel series, following the passing of original author Robert B. Parker. Fox Home Entertainment will release a new Heat Blu-ray entitled the Director's Definitive Edition on May 9, which comes nearly two years after the movie celebrated its 20th Anniversary. Heat also starred Diane Venora, Amy Brenneman, Ashley Judd, Mykelti Williamson, Wes Studi, Ted Levine, Dennis Haysbert, William Fichtner and a young Natalie Portman. Hopefully we'll have more on the Heat prequel novel very soon.